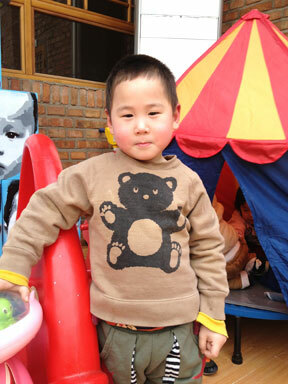 Jeremy is 5 years old and he is a fantastic kid! He's bright, cheerful, eager to be involved in things. He enjoys doing crafts, and is actually quite good at them. The aunties report that Jeremy "likes helping other children. Every time when distributing snacks, to a child with no hands, Jeremy will say on his own initiative: 'teacher, I feed him.' All aunts like him very much." Jeremy currently lives at our CHI foster home. He is post-operative for meningocele and tethered cord. He walks slower than the other kids, but he does walk independently and can go up and down stairs by himself. Jeremy is in physical therapy on a daily basis and is improving every day. He would improve even faster with a family of his own!